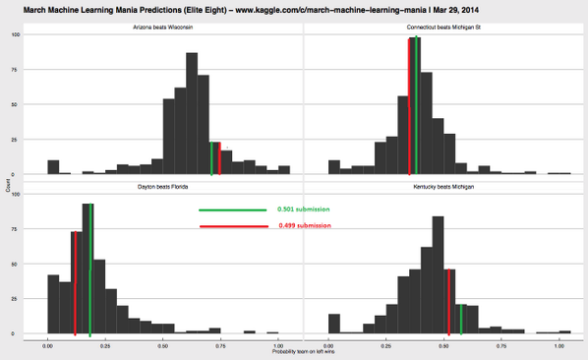 The website Kaggle sponsored a March Machine Learning Mania contest over the last few months, which involved picking probabilities for every hypothetical NCAA 2014 tournament game. Points were awarded, or taken away, given how well each submissions’ probabilities fared, relative to everyone else in the pool (for my statistics-oriented readers, it used the loss function from logistic regression). So, if you picked Florida over Albany with probability 0.80, while Florida won, you would’ve lost ground because the majority of entries had the Gators winning with roughly a 95% probability. Meanwhile, if you picked Ohio State over Dayton with probability 0.55, the Dayton win would’ve helped your entry out, with most folks having OSU as a roughly 80% favorite.